choose your oranges carefully. make sure they have thin skin and that they are not so large that they will not fit into the jars you are going to preserve them in. slice the oranges in rings no thicker than 1/8" beginning at stem end. arrange in a casserole dish in a single layer, slightly overlapping. once you have your first layer, sprinkle sugar to lightly cover. lightly sprinkle ground ginger on top as well (no more than 1/8 tsp per layer). continue with a second layer of oranges and repeat with the sugar and ginger. continue until you have reached your desired number of orange slices. remember to reduce the amount of syrup if you are reducing the number of oranges. sugar and ginger the top layer of oranges, cover with plastic wrap and allow to sit for an hour at room temperature. 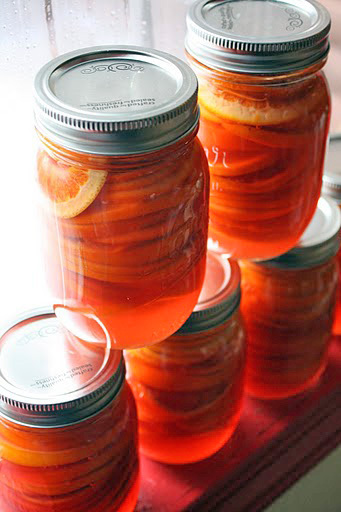 after 1 hour or up to 2 (if waiting longer than 2 hours, place in refrigerator) lightly pack your oranges into sterilized jars--each pint jar will hold approximately 20 pieces. place the sugar, water, blood orange juice and ginger in a saucepan over medium heat. add the leftover juices from your oranges as well. bring to a boil and stir until the sugar is completely dissolved and the syrup appears clear. remove from heat. using a ladle, spoon the hot syrup over the oranges, making sure there are no gaps of air. use a knife to maneuver the oranges so the syrup can seep through. leave a 1/4" gap at the top of the jar. seal the jar and process in a water bath per standard canning methods. i processed my jars for 20 minutes at high altitude, but i cannot guarantee that this method will be appropriate for your batch.